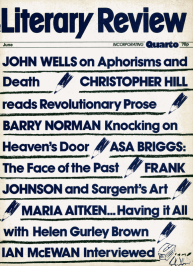 The New Musical Express is not, I imagine, a publication much consulted by readers of The Literary Review although it has a circulation of nearly a quarter of a million -.mostly among young people in their late teens and early twenties. The NME, as it likes to be called, has a number of fascinations: contemporary music, obviously, about which its staff write dense critiques that owe a little to heavyweight French critics, plundered third-hand, and rather more to Roget’s Thesaurus, but also modish issues – CND, police harassment and so forth. A recent issue, for instance. Carried an interview with Paul Foot, a rallying-call to Greenham and an attack on Mrs Thatcher’s handling of the Falklands crisis. However. the most singular by far is with a rather unlikely cultural icon: George Orwell.